Lufthansa Group | Newsroom : "To fly or not to fly"
Lufthansa adopted a novel way of marking the 400th anniversary of the death of English playwright William Shakespeare on April 23rd 2016. 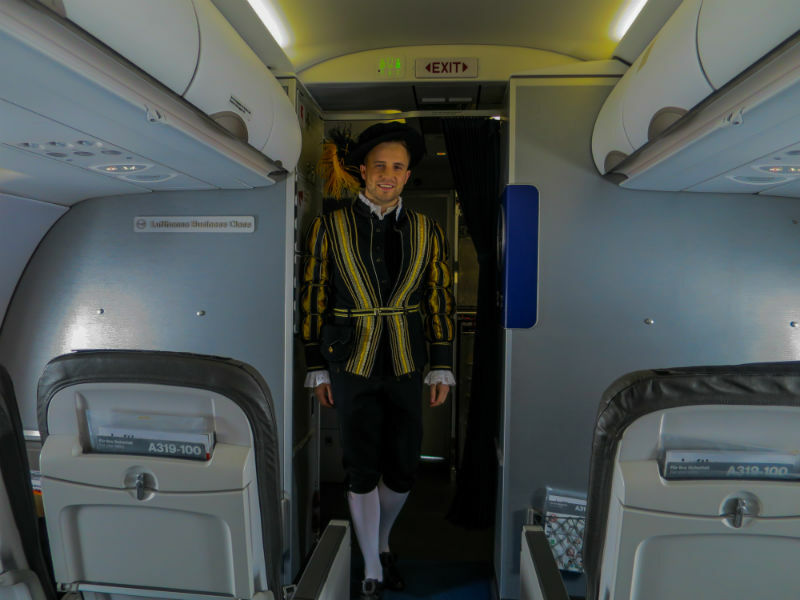 On the airline's flight LH 952 from Frankfurt to Birmingham, flight attendant Adam Sunderland performed the inflight welcome and farewell in distinctly Shakespearean English. You'll find a video clip of the event here. The choice of the Birmingham flight was no coincidence: the city is only some 40 kilometers from Stratford-upon-Avon, the town where Shakespeare was born in 1564, and where he also died, at the age of 52, in 1616. 'tis with the most wonderful pleasure that we welcome you aboard our chariot of the skies on this 23rd day in the month of April, two thousand six and ten. 'tis the day, too, when Mr. William Shakespeare of Stratford, nigh to Birmingham, the goal of our shared journey, departed This Earth four centuries ago. And in honour of the Bard of Avon, we are pleased and privy – nay perfectly privileged – to offer you these sweet greetings on our conveyance today. Captain Günther will be guiding our vessel to Albion's fair skies, accompanied by his/her trusty First Officer Mr Halle. And attending to your needs throughout our tubular transport shall be Mr. Zach and his/her well-seasoned team. So ease your loins, rest your reason and enjoy our hospitality aloft! We bid you a fond farewell from our chariot of the skies. We hope that you have enjoyed our shared moments among the clouds. We wish you the most wonderful of quadricentennials, and trust and hope that we may convey you aloft again in the none-too-distant future. Until then: fair flights, and adieu!